Made In America - IT MATTERS! We all know how the US Economy is facing challenges that we have not known in our lifetime. But it would be a mistake to think that the poor economy is the result of any single factor or is not the result of long term trends and poor past decisions. However, we have no doubt that one of the primary factors in the current economic tsunami is the fact that we simply stopped manufacturing products in our own country. Somehow it seemed to be acceptable to import the products we all consume or use…from cars to airplanes, steel to furniture, toys to TV’s, we simply allowed US manufacturing to dwindle to a fraction of what it once was. Those who argued “fair trade works� failed to see that the playing field was never “fair� at all. The USA took proper steps to make sure employee safety, employee welfare, environmental protection and product safety were mandatory of its manufacturers. Yet somehow the countries we imported from were not held to any of these standards. It seemed acceptable that we could import our products from countries where child labor, pollution, and slave wages were the norm. Were we all blinded by slightly lower prices? It was only a matter of time until our steel industry went into bankruptcy, our consumer electronics manufacturing basically disappeared, our wooden furniture plants all but closed down, and the garments we can purchase are all made in places around the globe...anywhere but the USA it seems. Some might argue that a country that does not produce vehicles (Cars, trucks, etc) is most likely a third world country. Are we heading in this direction? Worksman Cycles has witnessed this trend for the past 25 years, seeing so many of the largest, well known factories close and seeing the workers that worked there having to adapt to this new reality. Many of these factories, foundries, mills, etc were customers for our Worksman Industrial Cycles. We have witnessed the steady and unmistakable decline in the number of USA factories and the number of factory workers. Factories close down and get replaced at best by warehouses or shopping centers, producing absolutely nothing. Worksman Cycles has been able to find other customers for our industrial cycles, while many suppliers of these factories simply disappeared. The ripple effect is amazing when factories close. Anyone who has visited towns such as Bethlehem PA can see the results of a Bethlehem Steel going bankrupt and closing. The rusting infrastructure of a company that once employed tens of thousands of workers is a memorial to what has happened and is continuing to happen to our US manufacturing economy. Truthfully, this field trip should be mandatory for every US citizen. We can speak specifically about the bicycle industry, where 20 years ago over 10 million bicycles per year were proudly produced in the USA (out of approximately 12 million sold here). Sadly today more than 88% of bicycles sold in the USA are imported from China, leaving the remaining 12% to all other countries, including the USA. To put it simply, the number of bicycles made in the USA is basically insignificant. 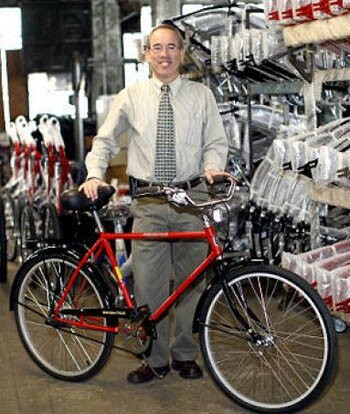 Worksman Cycles made a conscious decision many years ago to maintain our tradition of manufacturing our bicycles and tricycles right here in the USA. Most of our competitors thought we were just foolish and old fashioned believing we could remain viable in the USA, let alone New York City. It would have been far easier to do what most of our competitors did� .close the US factory and simply become an importer. Think of it, you can cut labor costs, cut overhead and just make life easier. But we thought differently� .we could control quality, offer greater diversification of product, maintain our integrity, while also allowing hard working American citizens the chance to do a good job and live the American Dream. It may seem an old fashioned concept, but we actually respect our factory workers and believe in our own abilities. As it turns out, Worksman Cycles outlasted most of the household brand names in the bicycle industry, most of which are simply out of business. Now consider the current state of our country and the economy including rising rate of unemployment, wage deflation, record numbers of home foreclosures, and bankruptcies. This does not even take into consideration the human emotion that goes with this, such as hopelessness, depression and decrease self worth. Having said this, the exodous of the bicycle manufacturing industry in the USA means that we too have to source many of our parts from overseas to make Worksman Cycles. We have little choice here as there are simply no US suppliers for many bicycle related components, including tires, tubes, spokes, saddles and other key parts. Even so, we continue to do our machining operations, welding, painting, wheel building and final assemly right here in the USA, even it if means that there is foreign content in our finished product. We simply have no choice. Our factory staff is committed to welding, building and assembling the best cycles we can for your ulitmate satisfaction. So the next time you make a purchase, ask yourself if “Made in the USA� means something. At Worksman Cycles we have always known that “Made in America Matters!� We’ve known this since 1898. We have not lost our way.